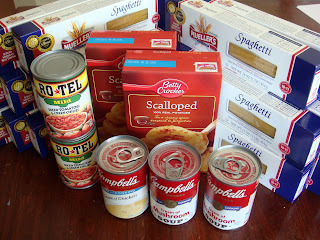 I have committed to donating $3 of grocery purchases to a local food bank each week. The scalloped potatoes were also a Publix "buy one, get one" at $1.75 each, topped with $.50/2 coupon ... brought the cost of 2 to $1.25. The campell's soup was on sale last week at Target for $.50, with coupons I paid $.30 per can, or $.60 for 2 cans. The RoTel tomatoes were also a Publix "buy one, get one" at $1.39, used a $1.00 coupon (I think it was $1/3, so I bought six for $4.20 and used 2 $1 coupons, bringing cost for each can to $.37 each. If that alone doesn't speak to the value of coupons and sale shopping, the total I spent at Publix yesterday was $53.94 ... and I saved $118.57. My cart was overflowing.